Description Set scaling trace headers (SCALCO/SCALEL) and optionally update related stored values (e.g. SCALCO -> SX/SY). 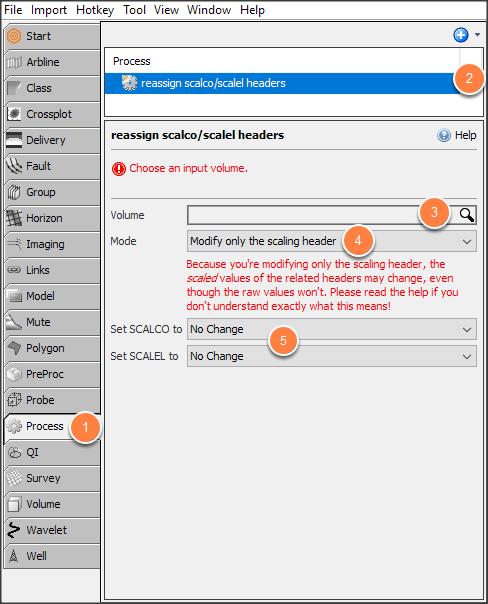 This process is the correct way to modify the SCALCO and/or SCALEL scaling headers. For certain headers (listed below), scaling values are applied to convert the raw header values to final useful values. This is generally done to store fractional values (because all headers are integers). In every context except for Header Maths (which allows you to directly manipulate raw headers), Insight will use the scaled value of a header. This process is how you fix or change that scaling. In the Process tab, click the "+" icon and select New Process. Select Reassign SCALCO/SCALEL Headers and type a name for the process. In the Details Panel, select an input volume. Select the SCALCO and SCALEL values. The resulting volume is created in the Volume tab. SCALCO is the header for scaling coordinate-related headers and SCALEL is header for scaling depth- and elevation-related headers. Because you are updating the scaling header without updating the dependent headers, the practical effect will be that the values of the dependent headers as used by the processes will change. You would use this option to fix an incorrect scaling header (that is, one that is inconsistent with the dependent headers). For example: Consider an input trace with SCALEL = -100 and SWDEP (water depth at source) = 2515. This means that the water depth is 25.15m. But if you know that the true water depth is 251.5m, then the SCALEL is wrong -- it should be -10. You want to change it without changing the value of SWDEP, so that your final scaled value becomes 25.15m. That is what this mode is for. The purpose of this mode is to change both the scalar and the dependent headers, so that the value used by Insight remains essentially unchanged (but with more or less precision). You would use this option if the scaling header is already correct (that is, consistent with the dependent headers), but you want it to be a different value. In keeping with the SEG-Y standard, the scaling headers can be power-of-10 values ranging from 1 to +/- 10000. When an Insight process uses a dependent header, it will multiply the value by a positive scalar, or divide by a negative scalar.